To understand whether Britain’s political system represents the rights and interests of the vast majority of people, it is necessary to analyse the technology available, how pressure groups influence debate and how the media frame public opinion. Adam Curtis’ documentary series The Power of Nightmares: “Baby it’s Cold Outside” (2004) claims that in the past, politicians offered us dreams of a better world. When this optimistic vision failed, people lost faith in ideologies. Today’s politicians are seen as managers of public life, instead of delivering dreams they promise to protect us from nightmares. Threats like the war on terror, that Curtis claims is an imagined threat, an illusion created and played out through the media. Such a view marks out a decline in trust in democratic politics, which in the last decade have become increasingly trivialised, with political consultants attempting to shape the public attitude. The Big Society aims to provide a platform to communicate, but pressure groups have emerged with similar intentions to engage communities into public discussions. These assemblies allow people to voice their ideas for a better future through collaborative production. Declaring it’s time for citizens to represent themselves. The revolution might not be televised but misrepresentation through the media seems inevitable. In the book The Structural Transformation of the Public Sphere (1989), Jürgen Habermas argues that in the twentieth century the critical concept of public opinion has been replaced by mass public, manipulated by commercial and party political interest groups (Outhwaite, 1996: 25). This decline of the public sphere thesis underplays the potential for social movements and mediated publics. Especially when we consider that technological advances are ‘ altering the way we are born, we live, we learn, we work, we produce, we consume, we dream, we fight, or we die’ (Castells, 2000: 31). Providing access to broader opinions, access to non-mainstream and localised political material, and offering greater interactivity than other media. The rise of communications media has overcome barriers and ‘made the boundaries of all social spaces more permeable’ (Meyrowitz, 1994: 67). Rather than being overwhelmed or distracted, ‘emergent publics’ (Angus, 2001: 55) have become more focused on relevance and collaborative production. Wikipedia being the most famous example, the non-profit organisation has thousands of volunteers contributing to articles around the world with collective action and shared responsibility. The ‘people’s encyclopedia’ has become one of the largest and most popular websites on the Internet (Alexa, 2011). Hans Magnus Enzensberger emphasises the capacity of an individual to be an active contributor to his or her own condition, unlike in ‘marches, columns, parades’ in which people are simply ‘pushed to and fro’; the mobilised persons would be ‘as free as dancers, as aware as football players, as surprising as guerrillas’ (Hands, 2011: 50). Enzensberger details the capacity to create multidirectional communication, disseminating knowledge and information on a scale and time-frame that was impossible before the emergence of the Internet. In recent years digital activism has come to widespread attention, the power of communications, networks and mobile technology, demonstrates the sheer power of cumulative connections (Hands, 2011: 3). The Internet has become a key resource for activism, allowing groups to raise awareness in issues that might oppose the mainstream. WikiLeaks are an organisation that takes this further by publishing and commenting on leaked documents. Designed to protect whistle-blowers, journalists and activists who have sensitive materials to communicate to the public (WikiLeaks, 2011). The organisation has been applauded and condemned for its approach to releasing information to the public, but despite the mixed reaction, there’s no denying that people coming together can make a difference. Since the publications of CableGate, WikiLeaks has faced an unprecedented global financial blockade by major finance companies including Mastercard, Visa and PayPal (Wikipedia). People should not be afraid of their governments. Governments should be afraid of their people – V for Vendetta (2006). The first step is admitting there’s a problem, and then collectively, people can work towards finding a solution. Fight Club (1999) could be interpreted as an example of how activist groups mobilise to challenge the mainstream. The narrator attends support groups, becomes increasingly disillusioned with consumer culture and through collaborative participation leads to the collapse of several financial buildings. The Anonymous Group parallel Fight Club, they are a large, decentralized group of individuals who share common interests. Members don’t talk about their involvement and they conceal their identities. The imagery of the "suit without a head" represents leaderless organization and anonymity. When appearing in public the Internet-based group use the Guy Fawkes mask popularised by V for Vendetta (2006) for ‘collective identification and simultaneous anonymity’ (The BBC, 2011). The group became well known in 2008, launching an online campaign against the Church of Scientology. Through a denial of service attack, they caused the website to crash and then manipulated Google search results to ensure that the Church of Scientology are the first hit whenever anyone enters the search string "dangerous cult" (The Telegraph, 2008). They have been responsible for similar attacks and highlight the collective potential for Internet ‘hacktivism’ (Sharp, 2010). Coordinating and organising through communications media for political purposes. Another people-powered movement that utilises the Internet are Occupy Wall Street and the other occupations around the world (occupywallst.org). Organized through a non-binding consensus based collective decision making tool known as a "people's assembly". They are fighting back against major banks and multinational corporations, who they believe are responsible for the ‘economic collapse that has caused the greatest recession in generations’. The movement is inspired by popular uprisings in Egypt and Tunisia, and aims to fight back against ‘the richest 1% of people that are writing the rules of an unfair global economy that is foreclosing on our future’. The concept behind the ‘We Are the 99 Percent’ slogan began on Tumblr (Weinstein, 2011), a microblogging platform that allows users to share various media. Its creator had no clue that it would go viral and become a touchstone for a protest movement soon to spread across the world (motherjones.com). Facebook was used to launch the Occupy London campaign on 15th October, the objective to reclaim space close to the London Stock Exchange. The movement use communications media to raise awareness, thus bypassing authorities, with Twitter being used effectively to group conversation and promote ideas. The mainstream media have been inconsistent with their coverage and increasingly people have turned to photography and video-sharing services to obtain information. YouTube and Flickr have been particularly popular, providing images of heavy handed police tactics and the solidarity between protesters. This method of documentary is a media output where the technology, the aesthetic, the social and the political intersect. The visual text has played an important role in shaping the story and asserting factuality. Walter Benjamin believes ‘that ideas are structured as images, and that what is at stake is therefore a praxis that can operate with images – a politics of images, not a figurative or metaphorical politics’ (Weigel, 1996, p. 10). The media are actively involved in constituting the social world. By making images and information available to individuals located in distant locales, the media shape and influence the course of events and, indeed, create events that would not have existed in their absence (Thompson, 1995: 117). The Internet offers many ways of connecting cultural-political content in a variety of forms and styles to audiences (Collins, 2006: 353). The problem is misrepresentation and the role the media play in shaping the public opinion. In Stuart Hall’s (1980) theory, the assumption is that any society’s dominant ideas will be encoded into its media messages. Let’s consider youth audiences, as unemployment continues to rise, university fees have trebled and there’s the perception that young people lack interest in politics. Such influence becomes particularly problematic for young people when certain media accounts, especially newspapers contain a bias towards negative content. The findings from this paper claim that it’s a long known criminological fact that a small number of young people tend to commit a disproportionately high number of offences, and that positive contributions to society by young people tend to be both overlooked and overshadowed. In Stan Cohen’s Folk Devils and Moral Panics (2002) emergent groups are referred to as a ‘threat to societal values and interests’, which are ‘presented in a stylized and stereotypical fashion by the mass media’. In response to the UK riots in 2011, The Guardian report that David Cameron blamed absent fathers and poor school discipline, whilst on the other hand Ed Miliband blamed MPs & bankers for culture of irresponsibility. Irresponsibility acknowledged by pressure groups and the opposition leader but ignored by the Prime Minister. Youth is a problematic category but the media defining them as the ‘broken society’ is also problematic. The Conservative Party’s white knight, the Big Society needs to replicate the grass roots revolution that was influential for Barack Obama. Without the Internet, Barack Obama wouldn’t have won the Democratic Primary, and would not have been elected President (Hands, 2011). Obama opened up a dialogue with people through new technology. This needs to happen in Britain otherwise the Big Society will be seen as just an imagined community. The government needs to do more to engage with wider communities, create opportunities and educate disillusioned groups. The media have an important role because they have the potential to influence the public but issues of trust, party allegiance and alternative sources have led to the fragmentation of collective values. The Internet has become an important political platform, national borders have become much less important and there’s growing organisational complexity in contemporary life. Global economic problems dictate the news and pressure groups have raised even more questions about trust and accountability. People are engaging with different, rather than shared, forms of media output (Washbourne, 2010) and the concern is that they ‘will engage with such different ideas that they will no longer desire to say anything to each other’. People spend an increased amount of time consuming mass media, but with so much information available it’s difficult to find accurate representation. This fragmentation has led to declining television audiences, and forced programme makers to redesign political broadcasts into entertainment packages. Rather than sustained and serious analysis, news and current affairs programmes are shorter, there’s an enhanced role for the reporter who often becomes part of the story, stories are provided with a good-versus-evil orientation and celebrities are used as key ingredients of the programmes. This model has been criticised, and rightly so, because although there’s potential for the content to reach a greater audience the content seems to be in the best interests of the media in much the same way as globalisation. To increase profit through commercialisation, benefiting from larger markets and generating the highest possible return in a ‘competitive climate’. The decline of the public sphere is evident, primarily because the media have too much control and powerful organisation control the information broadcast. It appears that the political system is outdated; globalisation and commercialisation have made it more difficult to be represented properly through the current model. The mainstream media manipulate the news and are able to shape the public opinion to ensure profit maximisation and market control. The Internet provides a gateway to access and distribute information, and through collaborative production each person can participate, make a proposal, raise questions, express their opinion and have a consensus regarding the outcome. This empowers individuals and collectively groups can challenge dominant views. Pressure groups have emerged and shown that it’s possible to use various forms of media to show the world that people can make a difference. Unfortunately we have also seen that the Internet can be used to censor material and makes it harder not easier for people to be interested. To resolve the problem, the government need to engage audiences and fulfil promises, the blame culture needs to change before we’re able to move forward. This won’t happen overnight but rather through evolution than revolution. Angus, I. (2001) Emergent Publics: an essay on social movements and democracy. Winnipeg: Arbeiter Ring Publishing. Blumer, H. (1969) Symbolic Interaction: Perspective and Method. Berkeley, CA: University of California Press. Hands, Josh. (2011) @ is for Activism. London: Pluto Press. Outhwaite, William. (1996) The Habermas Reader. MA: Polity Press. p. 25. Street, J. (1997) Politics and Popular Culture. Cambridge: Polity. p. 60. Weigel, Sigrid. (1996). Body-and Image-Space. Re-reading Walter Benjamin. London: Routledge. p. 4. Symbolic interactionism (Blumer, 1969: 2) can be used to explore how individuals act and evaluate meanings, how meaning is generated through social interaction and how meaning is interpreted according to encounters. In 1968, Andy Warhol predicted that “In the future, everyone will be famous for fifteen minutes.” In the age of reality television and video-sharing websites, it could be argued that has been achieved. Anything, or anyone, has the potential to become a viral phenomenon, and ordinary people can become celebrities overnight. The rise of communications media has overcome barriers and ‘made the boundaries of all social spaces more permeable’ (Meyrowitz, 1994: 67). Through social networks individuals identify with each other and communicate on mass, sharing information and experiences. These connections extend social interaction rituals, allowing celebrities and public figures to become more accessible, thus creating an ‘illusion of intimacy’ (Horton and Wohl, 2004: 375). The ability to connect and interact with anyone online has provided more freedom, but this virtual ‘self’ influences both online and real-life ‘performances’. We act differently; more confident and aggressive online which seems to compensate for the restrains we might feel in real life. As these ‘personas’ become more and more connected and entangled, there’s potential for it to become less easy to separate them. The derivative of Andy Warhol’s prediction could be that in the future, everyone will eventually become obscure for fifteen minutes. In order to understand how advances in communications media influence social interaction, it is necessary to analyse ‘the dynamic relations between producers, texts, technologies and interpretive audiences’ (Laughey, 2007: 78). Technology is changing the world; telecommunications have progressed from the early use of visual signals and audio messages to email, social networks and video-sharing services. The capacity and demand to exchange information in ‘real-time’, across significant distances is growing at an exponential rate. Real-time is when individuals respond to actions as they’re published, the exact time an action becomes visible being equal to the time it takes to ‘select, check, suspend, regroup and transform the meaning’ (Blumer, 1969: 5). The huge volume of this information produced means that there’s more emphasis on relevance, validity and first impressions. Erving Goffman’s self-presentation thesis can be used to explore the techniques deployed by individuals and groups to perform an expression of themselves to others. Goffman’s theories are mostly concerned with face-to-face encounters, but they can be applied to mediated forms of interaction. His model for understanding social interaction is the theatrical stage with individuals performing roles. The word person, in its first meaning, is a mask (Park, 1950: 249). The mask being a metaphor that everyone is basically playing a role; and it’s in these roles that we know each other and ourselves. At one extreme Pinocchio (1940), attempts to present himself in a light that is favourable to him when confronted about school attendance. He projects the claim that he’s telling the truth, but the impression he gives off doesn’t convince those present. If you feign the truth then your nose will grow. At the other extreme, we find the performance in The Invention of Lying (2009) to be cynical, deluding others for ‘self-interest’ but the expression is believed as an absolute truth and the ‘audience’ don’t question the validity of the performance. These are extreme examples, but indicate that obtaining fact lies beyond the time and place, such factors as the knowledge possessed about the individual need to be considered. Society is organised on the principle that any individual who possesses certain social characteristics has a moral right to expect that others will value and treat him [/her] in an appropriate way. Connected with this principle is a second, namely that an individual who implicitly or explicitly signifies that he has certain social characteristics ought in fact to be what he claims he is (Goffman, 1959: 24). Web-based social networks have made it possible for individuals to maintain social connections, share interests, activities and control expressions of themselves online through self-presentation techniques. William Shakespeare’s phrase “All the world’s a stage”, could have been referring to today’s Internet driven era. Facebook has become the largest theatrical stage, where individuals perform to their social connections, providing updates, sharing music, photos and videos. Goffman divides these ‘stage-managed regions’ of self-representation into two parts: ’front’ and ‘back’. On Facebook, individuals attempt to accurately represent themselves, the ‘front’ region through pictures, status updates and shared personal information. Consciously omitting flaws and presenting themselves how they would like to be received. The ‘back’ region emerges through tagged photos and regrettable actions that might create an unfavourable opinion. Facebook provides extensive privacy controls to protect individuals and options are available to remove any unwanted items from the timeline. Positioned as the essential form of interaction for our generation, the LA Times reported recently that ‘Facebook had passed 800 million users’, if the social network was a country, it would be the third largest in the world. Stretching across continents and bringing people together, new media technologies have no boundaries. Individuals from different backgrounds are able to interact with each other in real-time and inhabit the same social spaces. People are no longer defined by physical boundaries or places (where we are) but rather networks of information and knowledge (what we know) – facilitated by new media technologies that have no sense of place (Laughey, 2007: 85). Joshua Meyrowitz (1985) draws on Goffman’s notion of front and backstage behaviour, analysing electronic media and ‘how media can affect social situations and the social networks with which individuals identify.’ These media environments enable participants to share knowledge, regardless of literacy skills and develop interpersonal relationships. These are maintained without ever meeting in person, with information exchanged without a face-to-face encounter, which includes facial movements, gestures, and tone of voice. Increasingly television and electronic media, especially social networks and video-sharing services like YouTube, have led to public figures becoming more accessible and backstage behaviour being witnessed by millions. Kanye West has been involved in several high profile controversies. The Washington Post reported on the benefit concert for Hurricane Katrina, where he criticised George W. Bush claiming that he didn’t “care about black people.” The visual text is more significant than the opinion because those involved appear uncomfortable, displaying uncharacteristic behaviour. There have also been several incidents at music award ceremonies, where the rappers public performances have led to widespread criticism. Russell Brand, Jonathan Ross, Andy Gray and Jeremy Clarkson are other notable celebrities that have caused outrage in recent years. Politicians have also been exposed to high profile controversies, George W. Bush had a gaffe-prone leadership and Gordon Brown was caught on microphone describing a voter as a "bigoted woman". Britney Spears being the most controversial, with her breakdown being played out through the media. Meyrowitz suggests that a new type of behaviour has evolved, referring to this as ‘middle-region,’ which forces media personalities to be more accountable for their actions. Video-sharing websites though provide an alternative, creating Internet celebrities that are ordinary people whose backstage region can gain them widespread recognition. These ordinary people come from different backgrounds, achieve Internet fame and receive significant publicity. Social interaction around these video-sharing services produces interesting results, providing amateurs the means to gain exposure, respond to popular issues and reach an audience. YouTube comments have admittedly established a bad reputation for the value that they contribute to the videos, but essentially the only reading should be achieved through the visual text. YouTube has become the go-to website for ﬁnding topical and obscure streaming video clips, but everyday experiences also indicate how ﬂeeting such access can be. Viewers and academics have quickly come to treat the site as an informal archive of television texts (Hilderbrand, 2007: 48). John B. Thompson argues that media ‘help to maintain and renew our sense of identity, tradition and belonging’. YouTube rather than displacing corporate media, the video-sharing service recirculates footage, childhood memories and nostalgia. Another example is the challenges that face traditional print media, as advertising revenue and online distribution have changed how media is being consumed. The main threat will be its ability to understand, implement and embrace new interactive tools. The web still has ‘pages’, renewing existing news reading practices, and online distribution has the potential to reach further, provide more revenue and protect the environment. Thompson refers to ‘everyday encounters with media, especially television,’ as ‘mediated quasi-interactions’, which has the effect of bringing global events and issues close to home. Thompson was concerned with the process of interaction between media producers and audiences, and ‘the degree of reciprocity and interpersonal specificity’ (Thompson, 1995a: 84), that is available through other forms of interaction. The Internet has changed that because instantaneous exchanges, through which audiences can feed back their opinion, have become the norm. Twitter trending topics and hashtags are a contemporary example whereby conversation, grouped around syntax, contributes to interaction between media producers and audiences. The micro blogging service incorporates many of the concepts considered, bringing distant actions into everyday interaction with others. These dynamic relationships are complex, Goffman’s Presentation of Self in Everyday Life (1990) is mostly concerned with face-to-face interaction and how information is conveyed through conduct and appearance. Attempting to recreate a representation of ‘self’ online isn’t straight forward; Facebook encourages exchanges between friends and reproducing ‘real-life’ relationships. The relationship status is the most significant because it has become a passive-aggressive way to validate the ‘real-life’ connection and confirm that the person is exclusively involved with their partner. There’s so much emphasis on this in popular culture that the relationship is only considered official when displayed on the profile. Goffman refers to this as ‘hyper-ritualised mediated self-representation’, where media reproduce, artificially, what we learn about ourselves through face-to-face interactions (Laughey, 2007: 84). This can expand opportunities, but ‘online fronts’ can also be used to mislead and misrepresent. These advances are significant but ‘an alternative to, rather than accentuation of, face-to-face interaction’. Thus, the self-representation theory then can be interpreted as being ideological. Meyrowitz’s theory of placelessness, claims that media technologies make information and knowledge more accessible, they provide the shared domain but language and signification is presumed rather than asserted. The absence of technological, educational and social exclusion from Meyrowitz’s argument could be compared to The Matrix (1999) where knowledge is uploaded directly into the mind. This concept works in a simulated reality but fails to represent authenticity. Thompson’s theory of mediated quasi-interaction does maintain and renew, adapting to the ‘material and cultural conditions’. Audiences contribute to the dissemination of media messages, but also play an important role in the distribution. Thus an extension of his theory could be mediated quasi-production. The Internet has extended communities, created subcultures and provided companies with more reach to maintain audiences. These technologies have also exposed the focus on popularity, numbers and selfishness. Search engines provide the most popular results, follower counts and comments are layered across web pages and advertisers create this idealistic way of life. Thus ‘serve as a common resource for judging the adequacy of self and others’ (Glassner, 1990: 215). Let’s consider the advantages that communications media offers children, these include access to educational materials and communication tools, but as well as expanding opportunities they’re being exposed to situations beyond their years. The ability to connect and interact with anyone online has provided more freedom, but technology has led to misrepresentation, increased backlash and enabled protest groups to become more organised. During the UK riots in 2011, rioters coordinated through the BlackBerry Messenger system, built into BlackBerry handsets and free to use (The Guardian, 2011) causing widespread disruption. The Occupy Movement, which is an international protest movement, have used social media to raise awareness and bypass authorities. These acts are seen as deviance and often referred to as ‘criminal activity’. Howard S. Becker considers this to be a social construction, a ‘consequence of the application by others of rules and sanctions to an offender’ (Becker, 1991: 9). This could be interpreted as there being no right or wrong anymore, and that there's only popular opinion. Becker’s labelling theory provides an insight into the interaction between mainstream and deviant cultures but, often these groups find that it’s difficult to be represented correctly when they’re labelled as villains. The media contribute to maintaining and renewing this objective view, and this misrepresentation means that groups become disenchanted. Protests are inevitable, especially when people come together to act collective for a greater purpose. The Internet provides a greater reach to be heard, although being relevant is difficult when there are so many opinions competing for attention. It appears that the rise of communications media has not only affected social interaction but shaped society. Real-time conversations across significant distances are the norm, access to information, education, news and other data is instantaneous. Technology creates possibilities, providing the ability to build and maintain virtual relationships. Progress has been made but more problems have gained visibility and self-representation has taken on added importance. Goffman’s model for understanding everyday social interactions is the theatrical stage and through communications media, individuals attempt to accurately represent themselves and inhabit the same social spaces. People are no longer defined by physical places, and networks of information have arisen where collectively knowledge is shared and the meaning is interpreted. Social construction can be used to stereotype through the mass media, although popular opinion appears to challenge media institutions. The patterns of social interaction are changing all the time, perhaps that’s always been the case but more acknowledged through communications media. What’s certain is that through the Internet we have a gateway to infinite possibilities. Glassner, B. (1990) Fit for postmodern selfhood, in H. S. Becker and M. M. McCall (eds) Symbolic Interaction and Cultural Studies. Chicago: University of Chicago Press. p. 215 – 43. Goffman, E. (1990) The Presentation of Self in Everyday Life. Harmondsworth: Penguin. Laughey, Dan. (2007) Key Themes in Media Theory. New York: Open University Press. Meyrowitz, J. (1994) Medium theory, in D. Crowley and D. Mitchell (eds) Communication Theory Today. Cambridge: Polity. pp. 50 – 77. Park, Robert, Edgar. (1950) Race and Culture. Glencoe, Illinois: The Free Press. p. 249. Thompson, J. B. (1995) The Media and Modernity: A Social Theory of the Media. Cambridge: Polity. p. 117. The old school bingo community don't like them, they are old, angry, influential and ruthless. 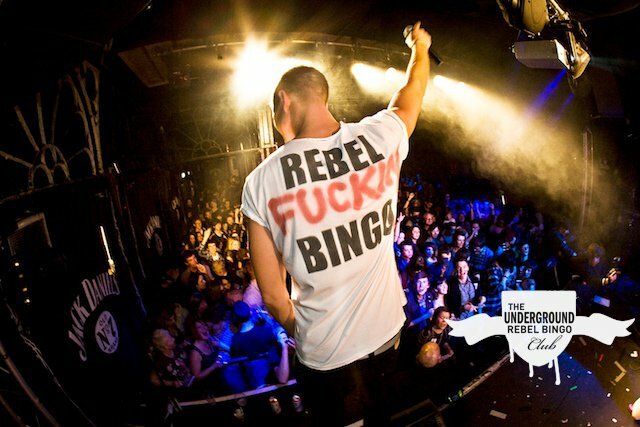 The Underground Rebel Bingo Club returned to Leeds under the guise School of Etiquette last night. After living in Ibiza for the summer, they have teamed up with Red Stag by Jim Bean to tour the United Kingdom. I have attended a few meetings, participants aren't referring to themselves as comrades, instead they're armed with a pen and paper and leaving their mark on each other. Literally! The Cockpit being the preferred venue this time, providing a raised stage for the hosts to conduct proceedings. Red Stag were on hand to assist with the build up, distributing more pens and placards to attendees. At this stage many people were already covered with ink; various names, slogans and profanity were visible everywhere. Don't tell mother! I contributed to several faces with moustaches and masterpieces before the performers took to the stage and the event started. The introduction, as usual, was built around the theme but attention soon switched to the main agenda for the evening. The first prize offered was the Panda, with the task being to complete one line on the bingo card. I listened intently to everything from the stage and marked down the numbers. I was optimistic but this was short lived as I was soon waving goodbye, outfoxed panda'd again.. The next objective was to complete two lines for the chance to win a giant Piano keyboard. I continued marking down the numbers announced, eagerly informing my friend how many I had remaining until.. Inspired by photographic messages from the Occupy Wall Street demonstrations, I wanted to acquire first-hand knowledge of documentary through hands-on experience. The natural impulse of anyone who sees a photograph of an individual in pain or in need is to reach out and help. Robert Capa , the legendary photographer always understood, he famously declared, “If your pictures aren’t good enough, you’re not close enough.” He recognised that only by recording individual gestures and facial expressions could he convey a sense of actuality (Whelan, 2005, p. 12). On October 15th the Occupy movement, which had been protesting in New York for the past month, arrived in the UK with a march on the London Stock Exchange. I attended the demonstration, with the objective to observe, record and apply the basis of Walter Benjamin’s concept of Aktualität, the theory of thinking and acting in images (Weigel, 1996, p. 4). This study will explore the basic idea of dialectical materialism, and whether art, in the age of mechanical reproduction, can be employed for revolutionary potential. Roland Barthes’ theory of semiotics is of particular salience in reading the photograph, not as an image but as a text. The photographic paradox ‘establishes a relation of immediacy to the material of the social or the symbolic. This is not materialism avant la lettre, but a re-reading­ of the material.’ The most important problem facing the semiology of images, is whether the ‘copy’ can produce true systems of signs and not just a construction of symbols. Barthes declares that ‘naturally, signification is only possible to the extent that there is a stock of signs, the beginning of code’ (Barthes, 1977, p. 34). The connotation of the photograph is produced through a modification of the reality, created by artificially bringing the main characters together. The obvious signifiers are the gesture shown by the man and the boy, the V sign, which has various connotations of “peace” and “defiance”, which are dependent on the cultural context and presentation; and the Guy Fawkes mask from the film V for Vendetta (2006) which has become an icon of popular culture. This political sign of the times provides a collective identification and simultaneous anonymity, an emblem for anti-establishment groups against corporate greed. 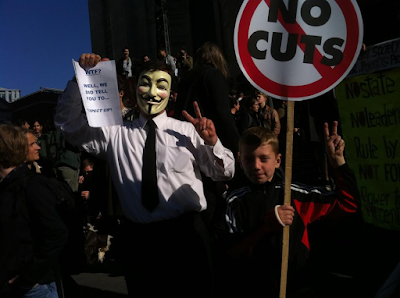 The Anonymous group use the mask as a symbol of radical transparency online, becoming popular during their campaign against the Scientology movement and more recently as a display of solidarity against corporate greed. [The mask] is worn by an enigmatic lone anarchist who, in the graphic novel on which it is based, uses Fawkes as a role model in his quest to end the rule of a fictional fascist party in the UK. Early in the book V destroys the Houses of Parliament by blowing it up, something Fawkes had planned and failed to do in 1605 (BBC, 2011). The pose of the subjects, which isn’t natural, and the mask, prepares the reading and how it’s received by the viewer. Without knowledge of the Occupy movement, the evidence indicates a protest; the crowd; the banners; the Guy Fawkes mask; and the hand gesture, which was adopted by the 1960s counterculture movement as a sign for peace (Wikipedia, 2011). When considering the historical formation, parallels can be drawn with the French Revolution (1789 – 1799), a period of radical social and political upheaval which corroborate and constitute elements of signification with the contemporary demonstrations. Even further back to the 16th Century, on the site where the photograph was taken, the fourth St Paul's, known when architectural history arose in the 19th century as Old St Paul's also encountered political demonstrations. Crowds were drawn to the northeast corner of the Churchyard, St Paul's Cross, where open-air preaching took place. It was there in the Cross Yard in 1549 that radical Protestant preachers incited a mob to destroy many of the cathedral's interior decorations (Wikipedia, 2011). Seen in this context, we can understand that the image is a statement about corporate greed. That ‘Formerly, the image illustrated the text; today, the text loads the image, burdening it with culture, a moral, an imagination (Barthes, 1977, p. 26). For Walter Benjamin, art must be evaluated both in terms of its depiction of the social reality of class antagonisms and in terms of its technique and position within the literary production relations of a given era. The photograph doesn’t depict class structure, other than the assumption that the protesters are the working class and are protesting for the best interests of the 99%. Members of the Anonymous group are regarded as the ‘disenfranchised youth who fall somewhere between the mid-to-lower income bracket’ (Colter, 2011). Instead the images deconstruct the stereotype that all protesters are students, as the man and the boy are not included in this bracket. We also have to consider the mechanical reproduction, especially through contemporary media. The resolution of the photograph isn’t high quality, captured using an iPhone and hasn’t been treated to enhance the detail. Potentially the photograph could have been uploaded to the Internet immediately through the devices 3G connection. In the background, a woman is taking a photograph of the man and the boy, which occurred frequently as many photographers who had attended the demonstration to document the events, were interested in his enthusiasm. Through contemporary media, anything has the potential to go viral; anyone can become a political activist and assist in launching a political campaign, especially when broadcasting through social media channels. This was the eventual outcome for the boy, as he was featured on the Ten O’Clock News that evening. Objectively, reproduction of any work of art is lacking its presence in time and space, the environmental setting, framing and lighting aren’t the same but the meanings can be discovered by profound thought and analysis. If I hadn’t indicated that the photograph was constructed, would the receiver have presumed that the man and boy were related? The boy in the photograph has a broken arm; on the cast the name ‘Kes’ is visible. This relates to the film Kes (1969), which focuses on 15-year old Billy Casper, who has little hope in life and is bullied (IMDB). The tagline for the film is ‘They beat him. They deprived him. They ridiculed him. They broke his heart. But they couldn’t break his spirit.’ In relation to the other signs, this takes on added significance, especially given the political symbolism. The boy’s name in the photograph is Lennon, named after the English musician and singer-songwriter John Lennon, one of the founding members of The Beatles and an active revolutionary when he was alive. These examples imply contemporary documentary photography, whereby photographers work converges more with social science, like anthropologists they justify their relations to the people they photograph. Documentary photography is tied, historically, to both exploration and social reform. Both are evident in the photograph. In viewing a photographic image we engage in a complex reading process which relate to our own expectations and the assumptions we make as to the subject itself. I chose the documentary theoretical approach because I believe the message is formed by a true source of emission and the point of reception is neither ‘natural’ nor ‘artificial’ but historical or cultural. I agree with Walter Benjamin, ‘that ideas are structured as images, and that what is at stake is therefore a praxis that can operate with images – a politics of images, not a figurative or metaphorical politics’ (Weigel, 1996, p. 10). Howard S. Becker refers to documentary photography as being ‘used to expose evil and promote change, ‘supposed to dig deep, ‘play an active role in social change, be socially responsible, worry about its effects on society in which its work is distributed. Howard S. Becker, is one of the founders of the visual sociology movement, in his essay on Visual Sociology, he outlines the three social constructions whose meanings arise in the contexts, organisational and historical worlds of photographic work. In his essay on Visual Sociology he describes how to read a documentary picture using the other social constructions; photojournalism and visual sociology. Taking a photojournalism approach; set on the front page of a newspaper, the photograph would have definitely provoked a reaction. However, the mainstream media would be reluctant to portray a photograph that was politically coded with the intention to promote change. Admittedly a photograph was featured on the Ten O’Clock News that evening but the image had been framed, the signifier of the man wearing the mask wasn’t visible and neither was the hand gesture. To support this, Becker implies that ‘newspapers seldom print photographs of anonymous people,’ and that it’s unlikely that the picture would have appeared in the daily newspaper, ‘because it (the photograph) is grainy [and] not in sharp focus.’ The only instance this would be excused is ‘during an expose of political corruption’ and more recently to provide contemporary examples, those photographs that depict a criminal act or celebrity scandal. The visual sociology approach would want to know much more about what we were seeing. Who the people were, what they were actually doing and more importantly what I was telling them about the image. This appears much more invasive than the photojournalist approach, but Becker goes on to state that the visual sociology social construction is correctly based on the assumption that photographs are easily manipulated. Although, they would not construct the meanings and neither would they see the problems associated with social science data. To conclude, the photograph that I chose was a contemporary documentary photograph that I took during the Occupy London demonstration. The photograph was part of an amateur series that attempted to document the events at St. Paul’s Cathedral. The objective was to explore and raise awareness through photography, the subjects used were children, primarily to conflict with the stereotype that protesters are students and to highlight that this is their future too. I understood that there would be various political banners, signifiers and connotations displayed around the London Stock Exchange and that photographs would be coded with various meanings and historical context. I expected that there would be minimal mainstream press exposure of events and wanted to formulate my own opinion. I have applied a basic grasp of dialectical materialism to this study, which is essentially a prerequisite in understanding the doctrine of Marxism. These connected notions surrounding truth, history and validation, assisted in the construction of the texts epistemology. Barthes, Roland. (1977). Image Music Text. Translated by Stephen Heath. London: Fontana Press. pp. 16 – 22, 34. Becker, Howard. (1995). Visual Sociology, Documentary Photography, and Photojournalism: It’s (Almost) All a Matter of Context. pp. 84 – 86.